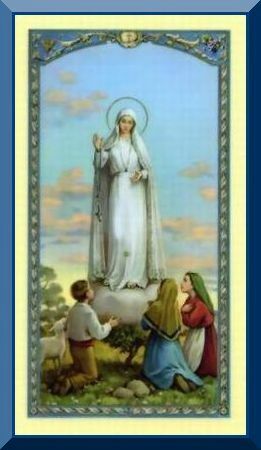 This Lady of Fatima Holy Card is laminated & shows Mary with the Fatima Children on the front. The Fatima Novena Prayer is on the back. 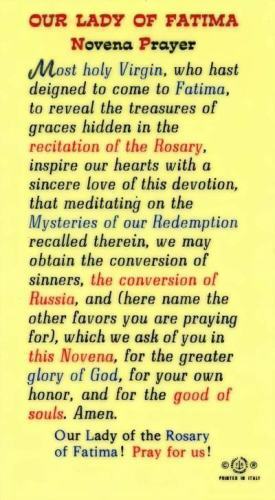 Most Holy Virgin, who hast deigned to come to Fatima, to reveal the treasures of graces hidden in the recitations of the Rosary, inspire our hearts with a sincere love of this devotion, that meditating on the Mysteries of our Redemption recalled therein, we may obtain the conversion of sinners, the conversions of Russia, and (here name the other favors you are praying for), which we ask of you in this Novena, for the greater glory of God, for your own honor, and for the good of souls. Amen. Our Lady of the Rosary of Fatima! Prayer for Us!